Immigrant Song...I've Got The BEST EVER!!! Looking To Test Your Genea-Knowledge? I Won A Handy Backup! Data Backup Disaster - Oh My! At some point, William McBean [William's father], brought his wife, Sarah, and his oldest son, John, into the the Potts Valley area of Monroe County, Virginia [now West Virginia]. Just a few months later, on his 12th birthday, young William was also placed through the county poor for indenture. A copy of the contract is above. I have left the grammar exactly as the original was written. There are no paragraphical or line delineations. You will also note that punctuation is sporadic at best. Young William was taught to be a blacksmith. It was a trade he did not use. Instead, 9 years later on 20 Nov. 1813, he married the daughter of one of the county's most influential residents, Joseph Wiseman.He married Rachel, who was born in 1790. By 1820 William had begun to have a collective amount of land that would net him a fortune [worth a couple of million dollars today]. He brought a suit against a Mr. Ballard in Monroe County [to whom he had been indentured], and won a large sum of money which enabled him to begin his climb to fortune. While the suit is named in Monroe County, records, no one, to date, has located the details of this suit. I have searched through the County Clerk's records for the time, and if the suit actually went to court, the records are not there to support it, although the date for hearing was set and is noted on the court calendar. William led a full life. He and Rachel were married just 13 days shy of their 43rd wedding anniversary, when she succombed to a fever. [Their daughter Nancy had fallen from the same fever just 27 days earlier.] Rachel was buried in the family cemetery on Potts Creek, near present day Waiteville, WV. William was 72 years old when he lead a posse of "home guard" to arrest some renegade's from the Civil War who had stolen items from various homes in the area [the latest being clothing from a washline]. As he was approaching a cabin in Wiseman's Hollow, one of the renegade's shot from the loft of the cabin. The bullet hitting William in the top of his head. He was carried back to the Bean home on Potts Creek, and "layed out" in the parlor. He was buried the next day in the family cemetery beside his love, Rachel. From the county poor, to one of the most wealthiest men in the county at the time, William Bean overcame and prospered. When I hear individuals say that they are victims of their circumstance, I am compelled to them that we are all victims. But we must rise above that victim mentality to become victors. What an example I have had to come before me. William is but one of the examples from which I have shaped my life. The poor little boy, who was placed up for indenture on his 12th birthday. He was my great-great-grandfather. Okay, so I've done it yet again! Another SNGF challenge that I don't get to respond to until Sunday morning. 2) Find out how to create a Calendar to show birthdays and/or anniversaries of yourself and all of your ancestors (or all relatives, or all persons - your choice!). The "Help" button is your friend here!!! It can be done in all of the current software programs. 3) Create your calendar. Pretty it up if you want. Save it. 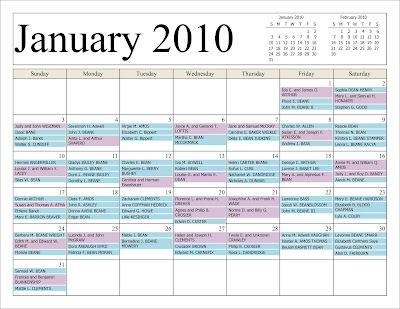 Can you show us a page from your calendar - say January 2010? 4) Which of your ancestors (or relatives, or descendants - your choice! ), if any, were born on 30 January? And for #4, who was born on January 30th? 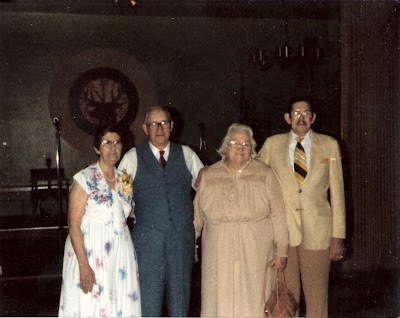 Lavonna Beane Smarr; Elizabeth Carithers Saye; Gustavus Clements; and Alan D. Fairburn. Randy, I've got to say, this has been the most fun I've had on a SNGF challenge is quite some time! And it taught me something about my program that I didn't even know about it! So, many thanks for this wonderful challenge! And keep them coming!!! Since I write so often about my five children, I thought you would enjoy one of my more sentimental photos of them. 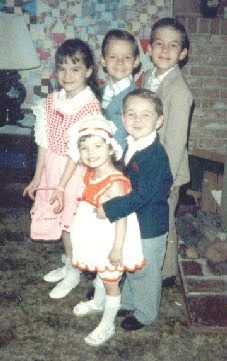 This was taken on Easter Sunday of 1987. Everyone called them my “stair-step children”. I guess you can see why! In the photo Chris was 8, David & Debbie 6, Mike 4, and Crystal 3. "Play with WorldCat.org. WorldCat is a massive network of library content that the public can search for free (user name and password not required). Not every library is a part of WorldCat, but the vast size of the network makes it an important genealogy tool. If you are looking for a specific book or publication, enter the identifying information into the WorldCat search box and see which libraries hold the item. You may even find that you can get the item through your library’s inter-library loan program. Don’t forget to search for some of your more unusual surnames and see what comes up. The goal is to play with WorldCat and examine its possibilities for your own research. If you’re already familiar with WorldCat, play with it again. The network and collection grow and change constantly. If you have a genealogy blog, write about your experiences with searching WorldCat for this exercise. This challenge runs from Saturday, 30 January 2010 through Friday, 5 February 2010. And remember - as Amy says - these should be fun exercises! Don't feel that you have to participate each week, nor should you beat yourself up if you miss one or more challenges. We all have so much that we want to accomplish - let alone what we want to accomplish with our genealogy blogs. This series should be one which, by the end of 2010, helps you to be a better genealogist." to relate to anything near what my "orphan" Bean's information might be in. just have to plan a trip to Richmond for this!!! I did find this an interesting challenge. And I actually did find something in the Library of Virginia that may be more than beneficial for me to view [Faudree family Bible]. While my library does not participate in the WorldCat or in interlibrary loan from out of state, I do frequent the Library of Virginia in Richmond about 3 or 4 times a year. I was not aware of this collection, and you can bet that I WILL be seeking it out! Thanks GeneaBloggers for a great challenge!!! 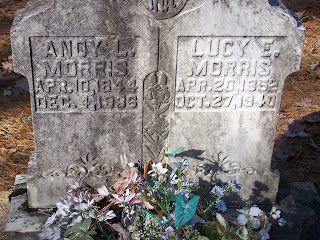 Following the Tombstone Tuesday post, in which I blogged regarding Andy Morris and Lucy Caldwell [ancestors of my children – but not mine] I decided to follow through with my eldest son’s Ahnentafel and continue with the Morris family line. 22. Andrew Lewis Morris – b. 10 Apr 1844 , Monroe County, [West]Virginia – d. 04 Dec 1936, Monroe County, West Virginia; M: Lucinda L. Caldwell [1852-1940] either 29 Apr 1878 or 03 May 1878 in Monroe County, West Virginia [there are marriage records for this couple on both of the dates listed]. v. Andrew Lewis Morris, Jr.
44. Nathaniel Morris – b. 1801 Monroe County, [West] Virginia – d. aft 1870 Monroe County, West Virginia; M: Jane Ralston [1802-bet. 1850-1860] 14 Nov 1821, Monroe County, [West] Virginia. The site offers some very good insight into various aspects of genealogy, from documents, to photos, music, and more! Great info. 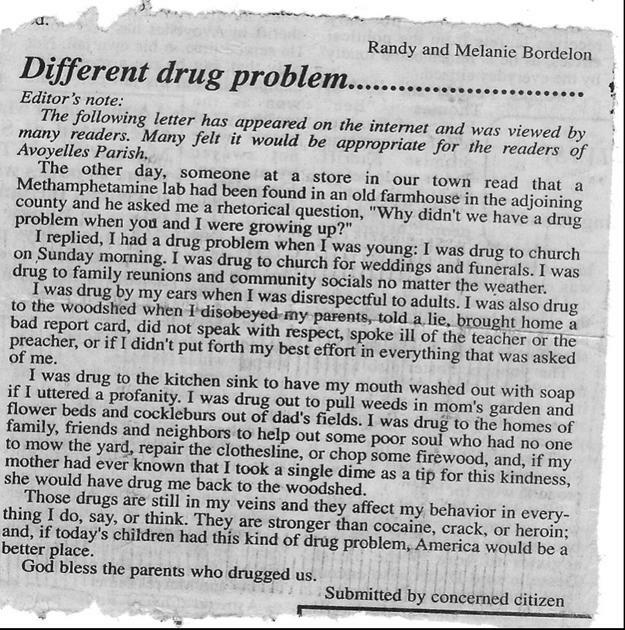 Excellent writing. Enjoy! The following are photos of the interior of the old William Bean home, as posted yesterday. The stariway leading to the 2nd floor. The doorway leading to the stairs. A window, where once there was a chimney, looks out on the beautiful Potts Valley, toward Waiteville. Although the exterior has changed a bit, there has been siding placed over the logs and both stone chimney’s have been removed, the interior remains much the same as it was when William and his wife, Rachel, lived there with their family in the 1840’s-1860’s. Only electricity and a modern bath added. The rear extension behind the house is a complete modern addition. Okay, so I was so-o-o-o jealous when other genealogy researchers and bloggers got to attend the Family History Expo in Mesa, Arizona last week. But funds are limited, and so I just couldn't get there. Well, thanks to some great folks, we are getting some wonderful information from that conference! 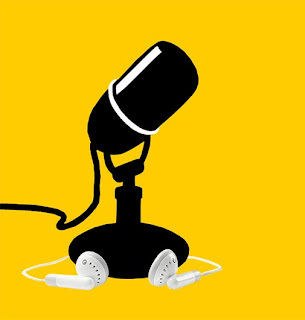 One of the really great ones is the Genealogy Gems Podcast, which is hosted by Lisa Louise Cooke. And on the Friday evening meeting Lisa recorded her first ever LIVE! Genealogy Gems podcast. Lisa introduced her daughter, Lacey Cooke, who is her Stage Manager. Following that she did an interview with Gena Philibert Ortega [Gena's Genealogy Blog]. They discussed World Vital records, and genealogy blogs. They discussed how to follow, subscribe through a reader and how to set up a reader. A fun interview followed with Thomas MacEntee [Geneabloggers] and Thomas' Top Ten Genealogy Blog Myths. As always Thomas' wit and humor had everyone laughing! Lisa went on to introduce Bruce Buzbee, who is the new Genealogy Gems Podcast sponsor. [Yes, you recognize Bruce's name from Roots Magic!]. They discussed the new Roots Magic software, and the free [yes, free!] download version you can get! Lisa's last interview was with Anastasia Tyler, from Ancestry. They discussed the collaborative effort Ancestry had in producing 'Who Do You Think You Are?" with NBC. [The show will air on Friday, March 5th - see our previous post today with the trailer!] They also discussed the new things that will be coming up on Ancestry in 2010. This was an upbeat and exciting podcast! And you won't want to miss it! So, be sure to visit Genealogy Gems Podcast now [Podcast #79]! NBC has released the trailer for their long awaited "Who Do You Think You Are" series which will begin airing on Friday, March 5th, 2010. Andy Lewis Morris was born 10 April 1844 in Monroe County, [West] Virginia to Nathaniel Morris and Jane Ralston. He married Lucinda “Lucy” E.V. Caldwell , born 27 October 1852 – Craig County, Virginia,daughter of Jacob Caldwell and Susan Huffman; in Greenbrier County, West Virginia on either 29 April 1878 or 02 May 1878. There are two marriage records for this couple, one on each of the two days listed here; so I am not sure which is the correct date. The one for 02 May does list the minister who performed the ceremony, Rev. V.W. Wheeler, so perhaps it is the correct one. Andy and Lucy had at least 11 known children: Martha, John, Walter, Ada, Andy, Archibald, Della, James, Earnest, Birdie and Lillian. Andy and Lucy are buried at the Hylton Cemetery, Glace, Monroe County, West Virginia. Here lately, I’ve been getting a strange number of odd requests from blog readers regarding my blog. And while I can say I am humbly grateful to know somebody is reading my blog(s), and I’m not speaking to myself all the time, it is a little maddening at some of the requests I have been getting. Let me share just two of these with you. That was it! No mention of either individual’s names. Nor the writers name! Let me address this issue. First of all – re-read that question. Do you see it? Grandpa was married to “great-great-grandma” [no that’s not a typo on my part, I simply copied and pasted the original email here]. Second no names for either grandpa or great-great-grandma. If other researchers are anything at all like me…and I hardly presume to put myself in the same category with some of the elite company I happen to read about… I write about dozens of individuals each week. Both my own research and that I do for clients. I sometimes mention clients’ research in my blogging [with all names, places, etc. changed to protect my clients privacy], but only in passing [ie: I found a record I was searching for – this is how I did it; I was surprised to see mention of this in a record I located; etc.] So, to have me remember what, or who, I have written about without any reference, such as even the date I wrote about this individual, well, you get my drift. Okay, this person actually did go on and mention the date the blog post appeared, and her grandpa’s name. I do apologize to her. Because, the person I mentioned in the blog post was my own grandfather as well. I mentioned the three children he’d had with my grandmother. You see, the “grandpa” she was referring to was actually her “great-great-grandfather”. Yep. She was descended from my grandfather all right. But from his second wife. Not his first, nor his third [my grandmother]. What the reader did not know, was that her great-great-grandfather had been married three times. She thought he’d only been married the once. So, I do apologize that in my nine years of attempting to locate all of his descendants [from the whole group of 15 children he’d fathered over a 40 year time span] that I somehow had missed this reader, and had not introduced her to the man he really was [I have since remedied that situation]. But the maddening thing I am illustrating here, is that I get these kinds of letter, like this “how dare you say this!” from individuals who haven’t a clue about the reality! Of course, in all honesty, I am fairly new to the world of blogging [I won’t have my second anniversary until June of this year], so these kinds of comments are new for me. And I was prepared for different kinds of barbs and unflattering comment. What I have been unprepared for are those individuals who comment with lack of intelligent knowledge on the subject they are arguing about! As my grandpa Dreher used to say, “Don’t go into battle unarmed”. If you see me posting something regarding any specific individual here, be prepared if you want to “argue”. I’ve done my homework! When is a paddy not a paddy? When it's a canvas, of course. 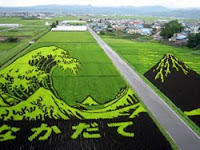 But as staff writer YOKO HANI discovered in northern Aomori Prefecture, what's nice to look at is rice to eat as well. Mysterious "corn circles" of incredible complexity that appear overnight, or a baseball park as in the 1989 film "Field of Dreams" — who knows what you might come across in your local rural idyll these days. It's neither a dream, a supernatural mystery, nor fiction. You can read the rest of this fascinating article on The Japan Times Online. Inspired by Chery Kinnick's immigration song... I had to post my favorite immigrant song EVER made! Sorry, folks... it just can't be beat in my book! As usual, a day late [well, you know the old saying!]. But then better late than...well, you know that one too! * Tell us about your "other" hobbies or interests outside of genealogy and family history research, writing, speaking, etc. But, believe it or not... I do get involved, and love doing other things! * I love to read! I am an eclectic reader as well! [Get that from my Grandpa Dreher!] Believe it or not, once [many moons ago] I was living in Texas with my first husband. We didn't have any money. No car. So I couldn't even get to the town's library. I had a desire to read so badly, that I literally pulled the canned goods out of the cupboard, and read them one by one. Yep. That's how much I love to read! I just recently started a blog "The Books on My Shelf" that reviews each of the books I read. I literally read 3-4 new books every single week. When I run out of new material, I go back through my old books, or will quickly download an ebook, and read! I almost always have 2 books going at once, and sometimes 3! Just can't read, or learn enough! * I love to crochet and knit. Although I never have the time any more! I used to do one or the other as I watched television in the evening. But I don't usually watch television in the evening any more. As a matter of fact, when the hubby is gone [he's a truck driver and gone Sunday through Friday] I never even turn the thing on! He will watch a little tv now and then; I don't even know why I have cable. It's really a wasted expense in our home! Anyway, back to the knitting and crocheting: I do want to crochet about 150 white snowflakes to go on my Christmas tree this coming Christmas. I'm going to craft an Ancestor Christmas tree this year. Photos of my ancestors and my husband's ancestors hanging amongst the crocheted snowflakes. Oh, I can picture it in my mind!!! Just hope I can make it look as pretty as my mind is showing it to me! Ha ha. * I love to cook! Last year I had decided to work my way through Julia Childs, Emeril Lagasse, Paula Deen, Rachel Ray, and so many others! I have dozens of cookbooks! I decided I would do something similar to the theme behind Julie and Julia [the 2009 movie blockbuster]. So, I sat up a blog, and I actually got several absolutely yummy, rich, wonderful recipes down. Then my doctor put the hammer down! Lose some weight, shape up, or I was going to get a new outfit. Complete with angels wings and a white gown. I just wouldn't be wearing it in this life!!! So, I had to start working on my poor physical condition. I've since gone all natural and health conscious. [When I do ANYTHING I go all the way!] So, I joined a health conscious group. And I blog daily on their web site. I also changed my on cooking blog, [you can view it here], where I blog about once weekly [sometimes more often] with a new healthful, nutritious, recipe. * I am a "grassroots" advocate. While I don't get out and physically campaign, I speak out in the manner in which I do best, and am trained to do. I write. I protest the way our country has taken a turn for, and I speak out to get Americans involved in protecting their own civil and national rights. I ferociously defend our constitutional rights. Again, I blog. It's the manner I speak out best in. 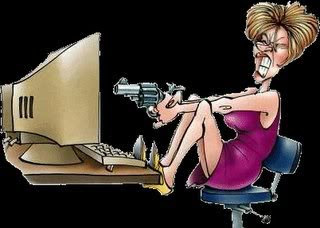 I blog daily at The Grassroots American.. Yeah, recently, I've even been labeled a "tea-bagger". That's okay by me. Call me what you like! I'm just me!!! * And I absolutely love, love, love my hubby. I've told the story before, so I won't bore anyone with it yet again, but he is my hero. My knight in shining armor. I literally live for the weekends, when he comes home and can spend one or two days here. He's usually too exhausted for us to do more than just know we're both home together. But the weekends are what makes my life!!! And that concludes this lesson in NEVER asking me what I enjoy doing!!! You see, there aren't enough hours in the day to do everything I enjoy most! And when you get me talking about all of those things.... well I never know when to shut up! 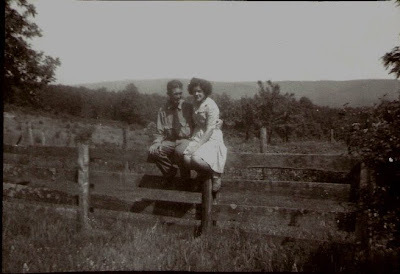 This is snapshot of my Uncle, John Monroe Beane, Jr. and my Aunt Mildred Tolley Beane. John and Mildred were married 23 Aug 1943 in Monroe County, West Virginia. The above photograph is believed to have been taken shortly after their marriage. The couple had four children: Betty, Johnny, Cathy and Darrell. John passed away July of 1972 at the age of 63. He is buried at New Zion Union Church Cemetery, Waiteville, Monroe County, West Virginia. Today I’d like to introduce you to my Stible family branch. 5. Mary Elizabeth Faudree –B. 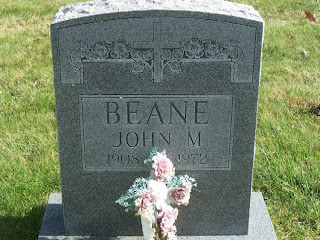 03 Jun 1897, Sweet Springs, Monroe, WV – D: 01 Jan 1975, Clifton Forge, Alleghany, VA; M: John Monroe Bean, Sr.  on 01 Dec 1935 Covington, Alleghany, VA.
10 Stephen Ledford Faudree –B.08 Jul 1857, Sweet Springs, Monroe, [W]VA – D. 16 Jan 1929, Sweet Springs, Monroe, WV; M: Eliza Carnefix [1851 – 1929] on 17 Dec 1878, Monroe County, WV. 42. Elijah Wickline – B. 1799 Monroe County, [W]VA – D. 27 Jun 1879, Sweet Springs, Monroe, WV; M: Elizabeth Lewis [b. 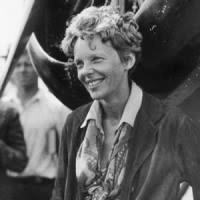 1795 – VA] on 08 Jan 1821 in Monroe County, [W]VA.
On January 11, 1935, the legendary aviator Amelia Earhart became the first person to fly solo across the Pacific Ocean from Honolulu, Hawaii to Oakland, California. During the flight Amelia became cold from the high altitude. Luckily she had brought along a thermos of hot chocolate. After the flight she commented, "Indeed, that was the most interesting cup of chocolate I have ever had, sitting up eight thousand feet over the middle of the Pacific Ocean, quite alone." Last week she was looking for the 1900 Census for the Hinchee family of Monroe County, West Virginia. Now, this particular family has a bit of sad history to it. First of all there is tragedy, but the worst of all…is the sad case that research indexers [yep, you know those kindly folks who index the census records, and such, over at places like Ancestry.com, to name but one] can’t seem to read the name Hinchee. Nope! Not a bit! Why, I’ve seen the name indexed as Hincher, Hinckee, even Hinckey and Hickey! Two years later, Giles remarried to a Miss Ida Dassa Surface, of the same community. A bit older than Macie, it appears that the couple did not have any children together, but that Ida finished raising Macie’s children as if they were her own. And so I decided to help my cuz out [well, I would give it my best try at least!]. So, I headed on over to my favorite records site, Ancestry. There I put in the info that I knew about old Giles. Born 1865 - Virginia. Died 1935 – West Virginia. First search gave me everything from Giles Hinchee in the 1930 Census [the only Census with the correct spelling found] to Gitis Hinchee in the 1910 Census. But nothing for 1910. So, I went back to the HOME page on Ancestry, and clicked on the Census year 1900. I figured I had to be able to locate them fairly easily. We knew they had not left the county. We also knew they lived in the same house for all of Giles’ adult life. So… it had to be a simple process. Right? So, I typed in the family surname, Hinchee. Clicked on West Virginia. And limited my search to Monroe County. Okay, here’s where the brilliant minds of the indexer’s came into play! Come on! The Hinchee’s are one of the oldest families in the county! How hard could this be! So, I looked at the Census taker’s handwriting. I truly expected to see some horrendous penmanship that would cause the many individuals who indexed to all agree the spelling was “Hinchu” instead of “Hinchee”. Now, I respect Ancestry, I really do. I’ve been a subscriber for many years. I purchase the biggest research package that they offer yearly, and I fully intend to continue doing so as long as I can afford to, but this was just a bit ridiculous! The handwriting was very clear and precise! There were no problems in differentiating between the “ee” on the end and the indexers “u”. Okay, so how many ways can you mess up on the spelling “Giles” [I’d already seen the 1910 census had him listed as “Gitis”, but it did come up in the search, so maybe….just maybe…..
And so I returned to the 1900 Census search page. There I put in only the first name, Giles. No surname. West Virginia. And specified Monroe County. I had found them. Yep. Sure enough, when I opened the link to the record, there was Giles, wife Macie, and their first two daughters, Mary and Lillie. As well as a Hinchee nephew, Luther [another line for my cuz to trace!]. So, what did this teach us? Number one – ALWAYS use the Soundex when searching. And number two, think outside the box. If we had searched using the last name alone, or even the two together, we would never had located them. But because of the somewhat unusual first name, Giles, when I used it alone, for a rural area, bam, the record came up first on the search. If only finding my car keys were half this easy. Now…. Where did I lay those things down at???? 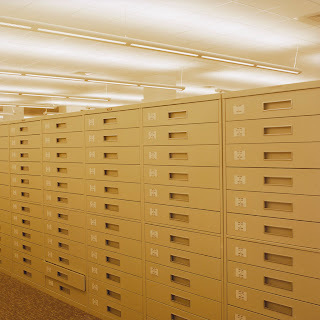 The National Archives is offering free archive research online classes! You can download these free lessons here. Or you can sign up [for $90] for graduate credit here. The author of this blog is ELYSE DOERFLINGER. Elyse can also be seen on YouTube where she authors and “stars” in her own genealogy info films. This young woman has been a guest speaker at several genealogy events, and will be a speaker at the Southern California Genealogy Jamboree this year. Elyse is a vibrant speaker, and writes from a broad base of genealogy knowledge with authority on the subject. Don’t let her youth fool you! She really is an up-and-coming genealogy star! If you’re not currently reading Elyse’s blog, I urge to head on over there and begin now! Yes, she can even teach an old dog a few new tricks!!! By the way, so nice to see someone of her youth becoming so well advanced in the field of genealogy! • Are any family relationships stated or implied? • Is the information reliable, usable, or simply a clue to further research? • What's the full citation for the document? If we'll keep these questions in mind, we will the MOST out of every document we locate! Following in the Geneabloggers tradition of showing you something I consider a treasure on Thursdays, I have been going through my expanisve photo collection, and sharing those with you. Today I'd like to introduce you to four of my great-aunts and great-uncles. Two couples. One from each couple are brother and sister. These are two of my maternal great aunts and uncles. Lorene and Greenie were brother and sister [my maternal grandmother’s sisblings]. Lorene was the youngest child of the family. 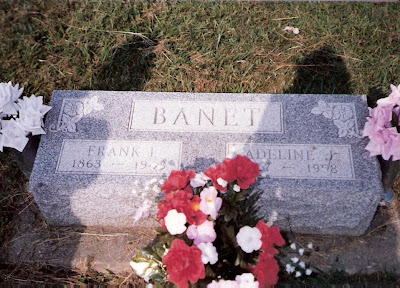 Lorene and Greenie were two of the eight children born to Francis Isidore “Frank” Banet and Adaline Eve. Greenie was born 11 Sep 1904 and died 17 Aug 1986. He married Cora Allen [1912-1993] on 26 May 1928. They had two children: Faye and Jerry. Lorene was born 15 Jan 1909 and she died 27 Mar 2005. She married Otis Lee Sr. [1908-1986] on 05 May 1934. They had five children: Emma Jean, Otis Lee Jr. [1937-2007], Ruth, Norman and Suzanne. Well, there's definitely a "can-can" petticoat holding those skirts out, and I see a parasol purse, and look at the little Sunday cap. Francis Isidore “Frank” Banet and Adeline Josephine [Eve] Banet. Frank was the son of Isadore Banet and Rosalie Sprigler. Adeline was the daughter of Joseph and Annette Eve. They are buried in the Edwardsville Cemetery, Georgetown, Floyd County, Indiana. The following is my submission to the current Carnival of Genealogy blogging event, which is an "Ode to my Family" event, in which a poem, rhyming or not, or a statement, regarding your family; something appropriate to introduce a book or a video about your family, is to be written for submission. My biggest brick wall is old William McBean, whose two sons were surnamed simply Bean. To date, we still do not know for certain where old McBean came from, or his past. His son, William, left a wonderful trail of paperwork to get to know something of himself. But the father? Well, it's all a mystery. Their records, it seems, are wiped clean! At the base of the place - Peter’s mountain. But old McBean’s records were wiped clean. Where oh where was his past? McBean came from what caste? So where to look for McBean? Perhaps in a DNA gene? There’s still no word on McBean. National and global events all happened somewhere, and historical markers mark the place where many occurred. But the richness of history is in its local details, details that can be insignificant on the global stage: the home of an individual who made a difference; a natural feature, building, byway; or something interesting that happened nearby. History is not just about the high and mighty. Markers tell stories and point out facts. There are countless thousands of great stories marked by markers—and some boring ones too. Some markers simply recite facts while others are insightful, obscure, cryptic, patriotic, fascinating, sad, funny, or just downright bizarre. Many of those markers are on these pages, others are waiting for you to discover and add them to this database. View some of these historical markers on the website, The Historical Marker Database. Upload photos you've taken of historical markers to share with others. Or view markers you may not have seen before. I believe this will become the "FindAGrave" of the Historical Marker community! I have really got to check my posts more often!!! Imagine how thrilled I was this morning when I was looking over the Geneabloggers Madness Monday posts and saw that my post from January 11th was included in tpday's Madness Monday group, and when checking for comments found that on January 11th Leslie Ann Ballou of Lost Family Treasures had gifted me with the Happy 101 Award! Along with this award I am supposed to list ten things that make me happy; and pass this award on to ten other bloggers. 1] My husband coming home on Friday night after being on the road all week long [he's a long-haul truck driver and gone from Sunday until Friday]. 2] The rain on the roof. 3] Wet kisses from any one of my grandchildren! 6] Completing a genealogy research project and having the client tell me how happy they are with the results! 7] Finishing a writing project. 8] Being told "We're going to print!" 9] Hearing, "Mom, I'm coming home for a visit!" 10] A good meal with a glass of fine wine. And how do I pass this award on to 10 who I admire when I admire so many??? Is there a way to to do that? If you are reading this, then please accept this award because you have made me so happy in reading this blog! Again, thank you Leslie for the award! Makes my sing!!! Joseph Eve, born 11 January 1829, France, immigrated to this country before 1858. He died 08 January 1892 in New Albany, Floyd County, Indiana. His wife Annette [maiden name unknown] was born 12 Feb. 1840 in Indiana. She died 01 May 1870. The couple are buried at S. Mary of the Knob’s Cemetery, in Floyds Knobs, Floyd County, Indiana. I know from the 1860,1870 and 1880 Census that Joseph was a farmer. And the couple had at least these children: Nicholas, Lawrence, Alfred, Charles and Adaline. Joseph's daughter, Adaline, was my great-grandmother. Born 11 Feb 1867, she died just one day shy of a full year before I was born. 5 Nov 1958. She is buried in the Edwardsville Cemetery, Georgetown, Floyd County, Indiana. Adaline married Francis Isidore Banet [15 Aug 1863 – Apr 1945] on 31 Oct 1893 in Floyd County. The couple had eight children: Robert, Arthur, Charles, Augustin, Francis, Clarence, Irene and Lorene. Irene was my grandmother. Born on 24 May 1906 in Floyd County, Irene died on 08 Aug 1989 in Gap Mills, Monroe County, West Virginia, where she’d gone to live with her youngest daughter, my mother, following the death of her husband, Henry Condar Dreher, Jr. [31 Dec 1902-17 May 1977]. Henry and Irene were married on 12 Dec 1923 in Indiana. They had five children: Ethel, Arthur, Marion, Billy and Lois. Lois is my mother. GeneaBloggers is doing it yet again! Giving us another season of wonderful challenges to help us improve on our blogging, and genealogy, skills. Assess yourself! You’re great at researching everyone else’s history, but how much of your own have you recorded? Do an assessment of your personal records and timeline events to ensure your own life is as well-documented as that of your ancestors. If you have a genealogy blog, write about the status of your own research and steps you may take to fill gaps and document your own life. Oh my! You caught me!!! Assess myself? I nearly fainted when I read that! So, pulling out the old files I began to take a close at what I have recorded of myself for my children and grandchildren, and [gasp] the future generations yet to be born. I'm so ashamed.... [don't look now, but I'm scuffing the toe of my shoe, my head is lowered, and there may even be a tear of regret in my eye]. Uhmmm, at the very beginning I am sure, as all I have for myself is the pertinent dates of vital statistics recorded in my genealogy program. Nothing else! I'll need to make a time line to even determine what records I need to add. How many educational degrees and certificates should I attach to this file, or do I just make mention of them? [I'm one of those habitual students you've read about. I never could decide what I wanted to be when I grew up, until I hit 40 and found genealogy!] Birth certificate. Marriage record[s] [oh yes...more than one]. Divorce date [do I dare place a copy of that in the file? oooh, yucky!!!] What about health records? I am a cancer survivor. Do I add the files for that ordeal, a mention of the cancer, what kind, brief mention of treatment, followup biopsy's, is that enough? I've noticed that those "fill-in-the-blank" family history books include clothing, shoe and ring sizes; do I include that? Oh, this is gonna be a real job!!!! Right now I've got a couple of clients I'm working on, so I can't get to this just yet. Maybe in a few weeks when things slow down a bit. Or maybe this summer when it's too hot to get out. Or at least......by Christmas. Just kidding. I know it's something I really ought to take serious, and get done. I know my family will appreciate it one day. I certainly would have appreciated my ancestors having done something similar! I do keep a detailed journal [I have done that since I was about 8 years old], so they will, of course have that should I fail to get everything in my genealogy files. But I promise, on my honor as a genealogy researcher, I will do my very best to make this my new commitment! I will post later with results of this new committment, as it begins to take shape. So be watching for that! 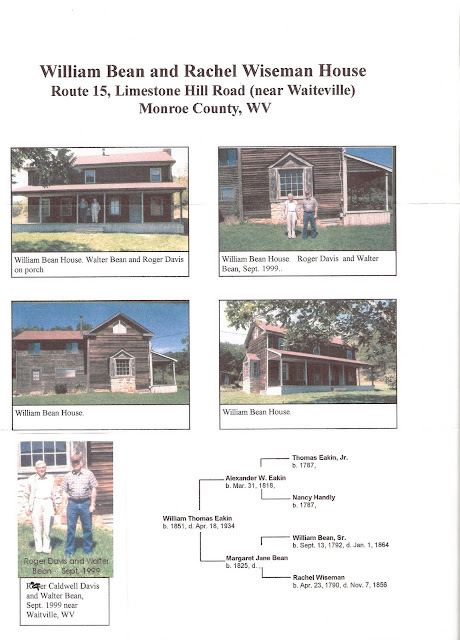 This is a series of photographs of the old William Bean homeplace, located near Waiteville, Monroe County, West Virginia taken by Roger Davis [Roger is my third-cousin, once removed - or at least I think, I have such a terrible time computing familial relationships and rely on my genealogy program to do that for me!]. Roger visited the old homeplace in September of 1999 with my Dad [that's him with Roger in the bottom photo]. This is the house that William Bean built for his wife, Rachel Wiseman Bean in the 1840's. The sturcture itself is made of log. It has been covered with wood-siding since about 1910. However, the interior remains log [in another post I will show you some of the interior shots of the place taken in 2009]. On either end of the home, you can see where there were once big, rock fireplaces. These have been replaced [since the 1970's] with windows. Hey there, it's Saturday Night, time for more Genealogy Fun!! 2) Tell us about that memory (just one - you can do more later if you want to) in a blog post, in a comment to this post, or in a comment on Facebook. It is 19[uh-hum - let's not even go there! Just know I am 12 years old! ]; it's a hot summer day in Norfolk, Virginia. I hop on my bike [yeah, it was one of the cool new spider-bike's, with the new-fangled banana seats with "flower power" designs printed on it, and had a straw basket on the front covered in "groovy" flower-power flower petals!]. I fly over to my friend Debbie's house, where she gets on her bike, and we ride over to James' house. Where somehow we just know that Kenny will also be hanging out. Here we taunt and tease the boys, who really have no use for us, but with whom we are definitely entrigued. Before we know it, the boys are mounting up on their own bikes and chasing us through the neighborhood. After what is probably a couple of hours of hot pursuit, we finally end up back at my house where cold glasses of ice-tea await us. Later Mom pops my sister,Eydie, Debbie and I into the car, and off we head to the beach, where we spend several hours frolicking in the surf and sand. We know we can always look toward shore and there would be Mom, sitting back with a book, but with one eye warily keeping watch over her charges. If we got washed too far down the beach and looked back to her, we would see her wave to us to move the play back up closer to her watch, and we would make our way back toward her. Afterwards we would dry off, head to the car, and stop at the local High's Ice-Cream parlor for a triple scoop of peppermint, pistachio, and butter nut ice-cream [or at least that's what my cone would have on it!]. Frantically licking our cones to keep them from melting all over us, we'd head back to the car and home. "I never can understand why playing in the water just wears you girls out! ", Mom would always exclaim. Nothing heavy for dinner on a day like this! Mom would make us bologna and cheese sandwiches for the evening. And afterward cut open a watermelon that had been chilling in the fridge. The cold, wet sweetness would slide right down after a busy day! Debbie would spend the night, and we'd crawl into my bed, all three of us, my sister, Eydie, Debbie and I [I was the one with a double-size bed], and we'd giggle until way past midnight when Mom would come tiptoeing in and say, "Okay girls, that's enough for tonight!" Finally we'd drift off. If you will click on the image below, it will open in a new window for better clarity and viewing so that you can read it in its entirety. Today I’d like to introduce you to my Tuckwiller line. 9. Margaret Smith Perkins – b. 03 Mar 1826, Greenbrier County, [W]VA – d. 11 Jun 1891, Monroe County, WV; M: William McHarvey Bean [1832-1890] on 26 Aug 1852 in Monroe County, [W]VA.
19. Elizabeth Tuckwiller – b 08 Nov 1779, Greenbrier County, [W]VA – d.28 Jul 1867, Greenbrier County, WV; M: Rev. Samuel Parkin [1778-1854] on 15 Sep 1812 in Greenbrier County, [W]VA.
38. John Tuckwiller – b. 1752, Virginia – d. 18 Feb 1832 Rich Hollow, Greenbrier, [W]VA; M: Catherine Riffe [1762-1823]about 1777, believed to have been in Greenbrier County, [W]VA.
1768, May 25 Entry obtained by Thos Takewiller in the Late Proprietor's Office for about 400 acres #963, surveyed 1 Nov 1787, actually 119 acres [Shenandoah County Survey Book 1785-1794]. 1774, Sep 27 John Duckmiller administrator of Thomas Duckmiller, John Duckmiller, Henry Whitich, and Samuel Stover enter into a bond in the Dunmore County Court [Shenandoah County Willbook A page 66]. 1774, Oct 20 Inventory of the estate of Thomas Tuckwiller, appraised by Philip Baker, George Hern, and Martin Comer, John Tuckwiller administrator, was returned and ordered recorded on 27 Dec 1774 [Shenandoah Willbook A pp 72-3]. One researcher theorizes that Thomas’s wife’s name was actually Sybilla, or Sybillia. There is a Shenandoah County marriage bond for Jacob Wollf and Sybilla Dockwiller dated 21 Sep. 1774. Of course, this runs amuck the date of death we have for Thomas. However, if John and Thomas “Duckmiller” listed above as actually John and Thomas Tuckwiller, then John appointed the bond for administrator of Thomas’ estate on 27 Sep 1774, which of course meant he predeceased this date. An inventory of Thomas Tuckwiller’s estate was appraised on 20 Oct 1774 [the date we have for his death]. So, the marriage bond for Sybilla/ Sybillia “Dockwiller” and Jacob Wollf would have been entirely appropriate. On 01 Nov 1787 Jacob Wollf was present at the survey for Thomas “Takewiller” property in Shenandoah County, VA [Survey Book 1785-1794, p93]. He is also listed on the 1787 Shenandoah County, VA personal property tax list. Sivily 1761-1860 married William Henson at Botetourt Co., Virginia, 1785. Death record indicates she is a daughter of Thomas. Christopher Hedrick swore in Sivily's pension application that she was his sister-in-law as well as stating the two were sisters [his wife and Sivily]. She moved to Greenbrier Co., (West Virginiaa. Nancy married Anthony Schoe at Greenbrier Co., (West) Virginia 1781. No proof she is a daughter of Thomas. 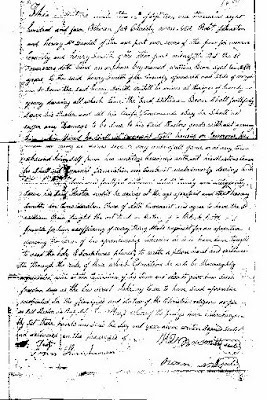 Thomas married Anna (-) Burner at Shenandoah Co., Virginia, 1789. No direct proof that Thomas was son of Thomas. Daniel moved to Montgomery - Bedford Co., Virginia, area, no proof he is a son of Thomas. I should probably have saved this for my Madness Monday blog! As you can see, it’s quite the “maddening” research! It is my hope to finally uncover who Thomas Tuckwiller was. His birth place and date. And hopefully find his long-lost parentage. 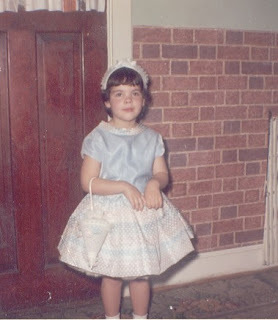 On today’s Follow Friday, I’d like to share with you genealogist and researcher Arlene Eakle’s Virginia Genealogy Blog. This is a wonderfully informative site for anyone who is researching ancestors in the Old Dominion State. Arlene’s grasp on early records, migration patterns, and settlements in the original colony are unsurpassed. "Arlene H. Eakle, Ph.D., is the president and founder of The Genealogical Institute, Inc. and a professional genealogist since 1962. She holds both MA and Ph.D. in English History (University of Utah) and an Associate degree in Nursing (Weber State University). She has completed post-graduate computer, web design and ecommerce courses (Bridgerland Applied Technical Center) and attended the Newberry Library (Chicago) Community and Local History course. She also attended the Dan Kennedy Ultimate Marketing Boot Camp and is a member of his Marketing Inner Circle. She is an expert in tracing ancestors from the Southern States including the Appalachian Triangle-southwest Virginia, northeast North Carolina, southeast Kentucky and east Tennessee. Her research for Scots-Irish and Native American pedigrees from this Triangle, although difficult to document, is especially successful. She is experienced in New York research, tracing ancestors from New England and New Jersey across New York into Pennsylvania, Ohio and Tennessee. And she is skilled in researching English, Scottish, Irish and Swiss German ancestors. "Dr. Eakle was one of the founders and original trustees of the Association of Professional Genealogists serving as president, 1980-1982, and as editor of the APG Newsletter and Green Sheet, 1982-1985. She edited the only periodical for genealogy teachers, Teaching Genealogy, 1988-1989. She currently edits four serials: Research News, Immigration Digest, Virginia Genealogy Notebooks and Researching Your Roots in New York (with Linda E. Brinkerhoff). "A prolific writer with more than 90 titles, she was general editor, with Johni Cerny, of the award winning The Source: Guidebook for American Genealogy (1984), and author of three chapters - “Census Records,” “Court and Probate Records,” and “Tracking Immigrant Origins.” The American Library Association recognized The Source as one of the Ten Best Reference Works of 1984. She is the author of “Court and Probate Records,” The Source, revised edition (1997). She co-authored the national best-seller Family History for Fun and Profit: The Genealogy Research Process and Genealogy in Land Records with Linda E. Brinkerhoff and Ancestry’s Guide to Research, with Johni Cerny. " Her personal business site is where she offers clients a super-substantial savings! Arlene has been in genealogy research since 1962 [yes, that’s 48 years!!!]. Her advice is right on the mark, as far as I am concerned! And she just may be the one to wear the crown of “Matriarch of Genealogy”, for this era!!! I highly recommend that if you have research based in either Kentucky, Tennessee or Virginia that you check out Arlene’s blogs. And if you need research, not to take away from my own areas of skills, but I can think of none other better to break through a brick wall than Arlene Eakle! So, cheers to Arlene!!! And go check her out!! !